Every bride and groom wants their wedding to be special. But where do you start if you want it to stand out from all the rest? There’s also the problem of cost. Not everyone has an enormous budget to play around with. Luckily we have five wow factor wedding trends that won’t break the bank. Pick out a brightly coloured bridal gown as opposed to the traditional white. Have a bridal party in an assortment of rainbow colours. Bold bright colours make a dramatic change to the over-powering white we are all used to seeing in bridal parties. For those not brave enough to swap a white dress for a brightly coloured one, use colour in other ways instead. To illustrate, use bright colours for the floral arrangements or in the linen. Colours are the easist way to factor in wow factor wedding trends. Vintage-style never goes out of fashion. Vintage includes classic cars, muted tones, lace dresses and stylish bouquets. Match these with soft furnishings and natural elements such as wood, glass and gold to get the perfect vintage vibe. Make your wedding photographs look vintage by choosing the correct filter. Ask your guests to dress in 1920’s style clothing and serve classic cocktails from that era. Pick music to suit the times and get a band to play them. Perfect! This trend no doubt started off with those waiters who were in real life, opera singers. They would surprise their guests by serenading them at the wedding table. Now that this has become well-known, couples are looking to up the ante and outdo the singing. Anything creative will do. Set up inspiring food stations that feature servers cooking exotic menus, or install interactive photo booths and games with professional actors. Think to how best you would be surprised if you were sat at a wedding reception and work from that premise. This is the ultimate wow factor; guests step into the wedding reception and their reaction is ‘Oh my goodness!’ Achieve high drama with lighting, either in one spectacular showpiece or in several different aspects. For example, cover trees in fairy lights or hang illuminated hearts from the ceiling. Decorations will also add high drama. Replicate the same thing over and over again, such as hearts, or choose an abundance of a certain type of flower. Replace standard furniture with LED furniture for instance. Guests will be immediately bowled over when they arrive. Walking up the aisle that is decorated with a few floral arrangements is so last year. 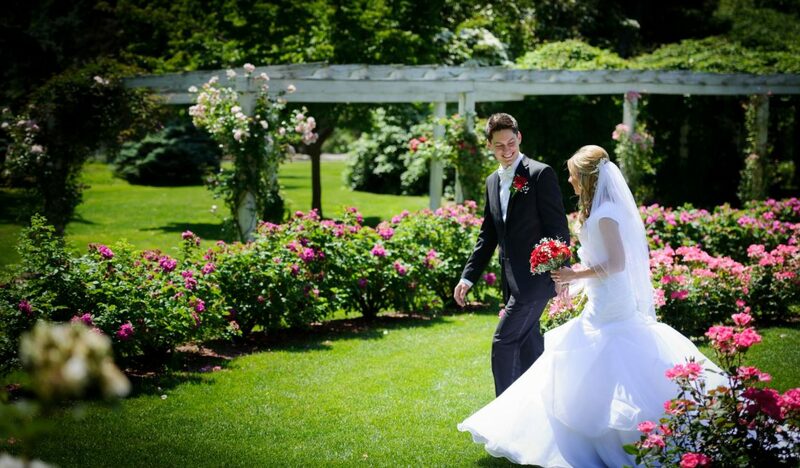 This year couples want elaborate entrances that work as a frame to capture their special moment. The entrances could be wreathed in an abundance of flowers, thousands of fairy lights, different coloured balloons or draped in beautiful silks. Add a human element, such as dancers or jugglers going before the bride and groom as they make their entrance. Whatever is it, make sure it’s spectacular.